Next Seminar is set on September 4th!! Save the date, and reserve your spot on our meetup page(http://www.meetup.com/therapy-8/calendar/13759396/). Any injuries and illnesses can be cured if treat them correctly. It means no medicines and surgery. Ki-Energy power makes it quite possible. If you or someone you know is suffering with pain please come to this meetup. I posted this news on my facebook (http://www.facebook.com/kienergytherapy ) the other day, but I thought it would be worth posting on the blog too, so here is the link. It seems like more and more people are becoming aware of the side effects of our gadgets, such as cell phones, computer, TV, microwave....anything that uses electricity...even lights. They listed a few possible symptoms including diabetes and cancer, but there must be a lot more. The article tells you to stay away from charging phones while you are sleeping and so forth, but it won't be enough if your bed itself conducts the wave. Please read my previous article(Unknown Danger 2)for more info. If you have a lot of heavy metals in your body, you will attracts a lot of electromagnetic wave, and therefore you will be at higher risk of getting the "side effects". As my other article(Eat This! ~2. Cilantro)suggests, it is very important to get rid of the metals from your body by eating a lot of cilantro. If you think you are receiving a lot of electromagnetic waves, please come see me. Ki(Qi)-Energy Healing Therapy can lead the effect of Cilantro to the organs that need it the most. 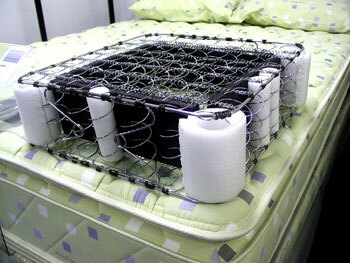 If your bed has spring coils inside, your body to receive electrical-magnetic field from your bedroom electrical outlet and devices become much higher than a foam and/or futon bed. Every metal including spring coils inside of bed has a character of drawing electrical magnetic field. So if you sleep on a bed with spring coil not only for 1 but 5, 10, or 20 years, chances of developing complicated diseases including cancer later in your life becomes much higher. It becomes more dangerous if coils are not finished pointing downward but outward, the area close to this coil you sleep on receives electrical magnetic field directly.. If the area you receiving electrical magnetic field is ovary, for an example, the chances of developing ovarian cancer becomes much higher than those who are not. The safe and healthy bed is Futon and/or the firm foam beds. Hopefully, a futon is made of cotton and not too soft or too thick. Hopefully, a foam bed is made from not too many chemically processed materials. A pillow should be comfortable height and firm. Again, hopefully, it is made out of healthy materials but, not too much synthetic materials because often time, we breath through pillow unconsciously at night.